The Good Wheel Project was first commissioned by the City of Melbourne in 2014. It was devised as a single program that could divert unclaimed bicycles from landfill whilst providing new opportunities for training and educating vulnerable road users. The program provided a reconditioned bicycle, locks and lights to different cohorts experiencing disadvantage, including recently arrived asylum seekers, young girls from CALD backgrounds and youth in alternative education. We devised a training program that familiarised these groups with basic bicycle maintenance, educated them in local bicycle rules and conventions and trained them in on road riding skills. 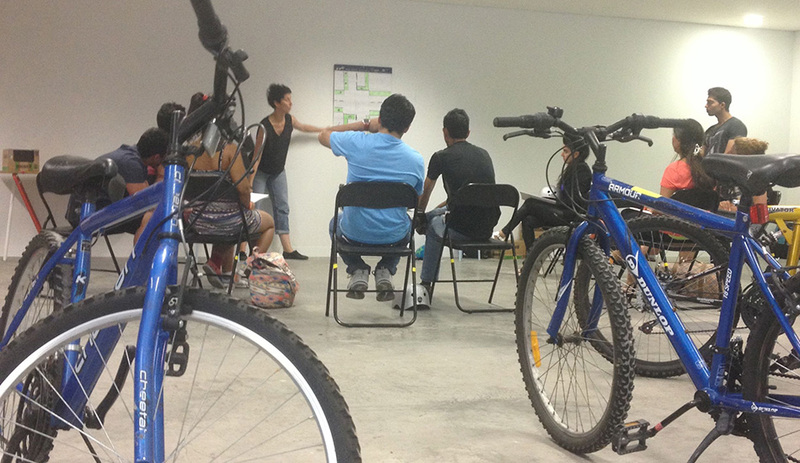 The program contained both classroom sessions, indoor and outdoor training and social rides. The Good Wheel Program was initiated by the City of Melbourne, and was delivered by a partnership between The Squeaky Wheel Good Cycles. Referrals to the program were provided by AMES, lights and locks come courtesy of Knog, and helmets from Nutcase. Over the years, a number of rounds of the project were funded by TAC Community Grants, City of Yarra, Victorian Women's Benevolent Trust, and supported by Victoria Police and The Huddle. Find out more below. We are continually surprised and proud of the continued success of the Good Wheel program. We are now on our 16th round of the program, with hundreds of participants having graduated the course.This latest round of the program is funded by the City of Yarra, and takes place at Collingwood Alternative School over 4 sessions in April 2016. Check out the video of the pilot project below.